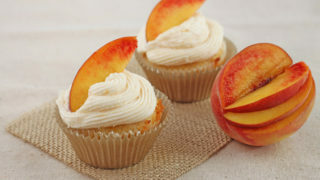 I dreamt up a cupcake made with fresh peaches topped with peach buttercream. We’re making fresh peach puree in the microwave today—it’s easy peasy. I tossed in a little fresh ginger into the cupcake batter last minute, and I loved it even more. We’ve suddenly had a cold spell in our area lately (low 90s instead of 100s! ), and it’s a good reminder that fall is just around the corner. Soon, I’ll be dreaming up fall desserts for two. I’ve been buying peaches by the dozen while I still can, and shamelessly letting the juice drip down my arm with each bite. Let’s cram fresh peaches into every dessert until fall gets here, deal? Make these cupcakes while there’s still time! Also check out Jessica’s version of ginger peach cupcakes. First, begin by making the peach puree: Peel and dice the peach and place it in a small bowl with the brown sugar. Cover it tightly with plastic wrap and microwave on high for 1 minute. Mash the pieces with a fork, then set aside to cool. Preheat the oven to 350. Line 4 muffin cups with liners. In a small bowl, beat together the canola oil and sugar until well combined. Add the egg, ginger and all but 1 tablespoon of the peach puree and beat until combined. In another small bowl, whisk together the flour, baking powder and salt. Pour this over the wet mixture and mix until combined---do not over mix. Divide between the muffin cups and bake for 18-20 minutes, until done (a toothpick inserted comes out clean with only moist crumbs sticking to it). Let cool completely before making the frosting. To make the frosting, beat together the remaining 1 tablespoon of peach puree with the powdered sugar and butter. Frost the cupcakes and serve. Ginger and peach? I’m obsessed already! Oh my love! This could be the perfect summer cupcake. Ginger and peach! Yum. And four cupcakes is just the perfect amount. Love that you made the puree in the microwave. Hope it cools down soon for you! These are so pretty and perfect. I love that you mixed up ginger and peach together. What a great combination. Perfect amount for when you don’t want an entire army of cupcakes in front of you to tempt you! Great way to use peaches before they’re gone! I love ginger and peach together, and you can’t go wrong with those flavors in a cupcake! Peach-crammed desserts for as long as possible? You’re on! 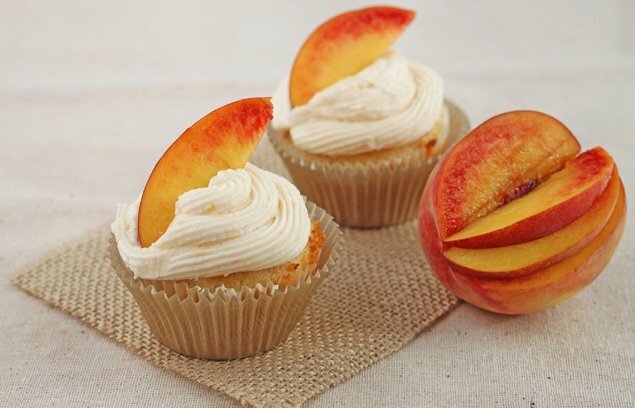 Love the fresh peach on top of these cupcakes – perfect for summer! Ginger & peach sounds wonderful! Ginger is probably my favorite ingredient to “just toss in” various recipes! And with peaches? These look SO awesome! This looks amazing but there is a small mis-direction in the frosting: “To make the frosting, beat together the remaining 1 tablespoon of peach puree with the powdered sugar.” This doesn’t mention the butter in the ingredients list. I LOVE your site and your recipes. your gorgeous photos are inspiring me to pick up some peaches on my way home tonight! these look super tasty, but what if you don’t have a microwave? hi christina: love your site. i promised birthday cupcakes to my boyfriend this weekend, who has requested yellow cake with buttercream. would it be possible to make a yellow cupcake using this recipe and replacing the one egg with two yolks? or is there something else you would recommend? Awesome– thanks so much for the quick and thorough response! Can’t wait to get started– I’m sure they will be fabulous.